Yebisu (Ebisu) is the neighboring district to massive Shibuya City. 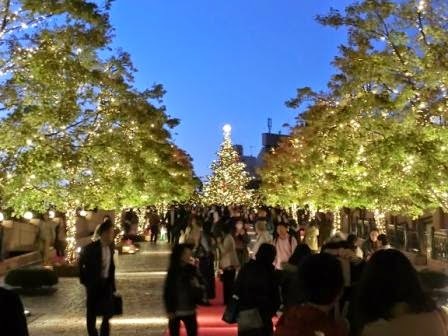 There is 5-Star luxury Westin Tokyo to stay, and in winter, Yebisu becomes even brighter. Today, I’ll show you photos, hotels and a tip about the views which few people know!Seeing is believing. What a beautiful place! 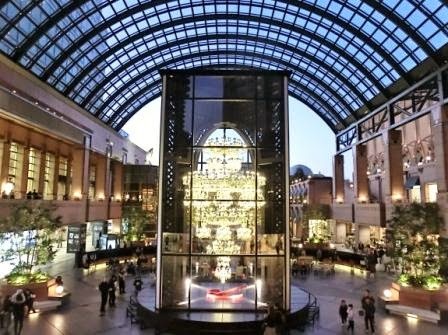 Yebisu Garden Place is located in front of JR and Subway Yebisu Station, which is the NEXT station to Shibuya. (For access information, click here!) Just going on the moving sidewalk of Yebisu Sky Walk, you’ll find yourself in a place with fascinating hotels, famous restaurants and events. They hold a Christmas & Winter Lighting Event and its gorgeous chandelier is very famous. Celebrating the anniversary, a Japanese designer made the largest Baccarat chandelier in the history. 8.4 meters high, 1.8 tons, and 410 million yen of crystals. Definitely it’s a must-see now. Behind the brilliant chandelier, there is a castle. A castle, yes. Actually, it is a restaurant by Joel Robuchon, a world-famous Modern French chef. Behind the castle is The Westin Tokyo, a luxury European-style hotel surrounded by trees. Furthermore, I know a local gourmet who said Westin‘s restaurants are the best in Tokyo. So many choices for restaurants! A red carpet is laid from the Christmas Tree to the Baccarat Chandelier. The romantic atmosphere is good as a dating spot for couples, too. There are also other events like fresh vegetable markets and seasonal events such as Christmas Marche starting on 21 November. Other than Joel Robuchon and Westin Tokyo, great restaurants, bars, cozy cafes and nice delis are all around here. Sculptures, a photography museum, Japanese beer museum… You’ll find some excitements every time in the year. 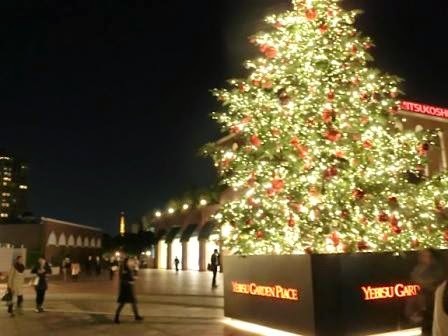 Not only the Christmas Tree, Tokyo Tower is shining over there. Take a rest on a bench. 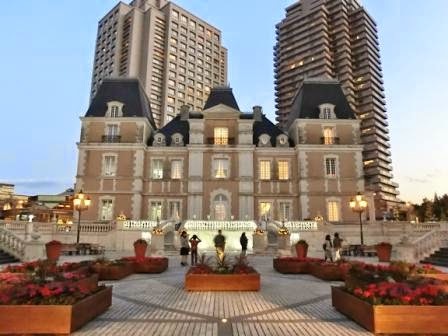 Now you know how Fantastic Yebisu is to visit and stay. Then, what is the tip in Yebisu? 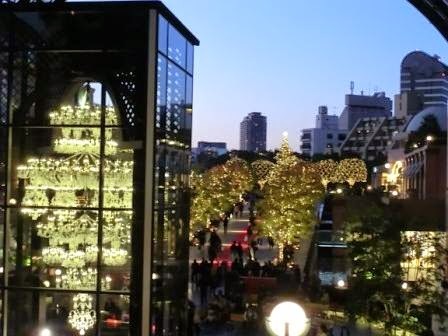 I must say Yebisu Garden Place Tower is a Hidden Gem for the view of…. Mt. Fuji! I tell you because you are a reader of Tokyo Direct Diary. Thanks! I am sure that its 38th & 39th Floors (the highest floors with restaurants) are one of the most scenic spots in Tokyo and a hidden gem as an observatory. Entrance fee? Free! 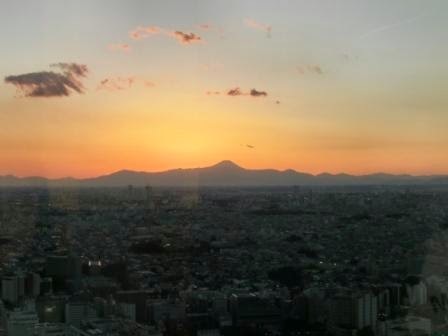 I said that the air is not very clear in summer when I wrote about Tokyo City View, the observatory of Roppongi Hills. It became crystal clear in November at last! Magnificent Mt. Fuji catches everyone’s eyes there. 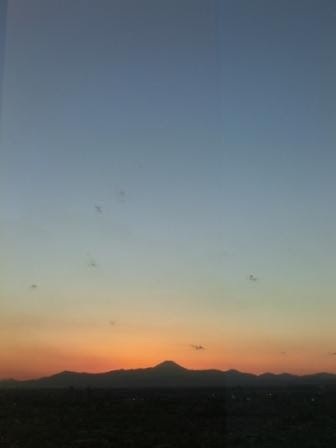 I remember that sunset is so breathtaking. Baccarat crystal glasses and the Christmas lights are very romantic, but I cannot forget that the colors of the sky are so beautiful. Choose a hotel with reading a local’s advice! – That’s the specialty of Tokyo Direct Guide. The Westin Tokyo: Yebisu Garden Place is just down the hotel. A fantastic luxury hotel of world-wide Westin Group. Fabulous restaurants inside. Convenient to visit Shibuya, Harajuku, and anywhere in Tokyo with JR Yamanote Line. The airport shuttles free you from any concerns about transport from/to Narita and Haneda airports. Even Brighter in November and December than usual! Hotels in Shibuya: One of the busiest, newest and brightest cities in Japan. A massive shopping distrist, too. Shibuya is not a place with hundreds of hotels, but ones you find are all good ones. Hotels in Shinjuku: Also one of the largest cities in Japan and the 4th station from Yebisu; quite near. You can choose a hotel from a wide range. Shinjuku Station is a hub, so it’s convenient to go anywhere in Tokyo. Moreover, if you plan to visit Mt. 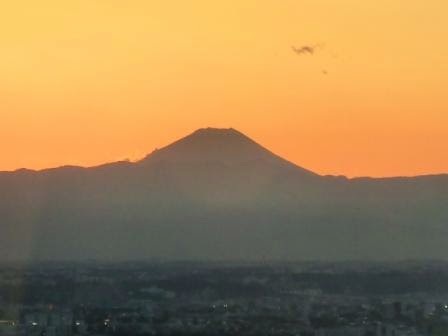 Fuji or Mt. Takao to explore Japanese nature as well as Tokyo’s tourist attractions, Shinjuku is the terminal. Talking about 5-Star luxury hotels, Hilton Tokyo Hotel, Park Hyatt Tokyo and Hyatt Regency Tokyo are in Shinjuku. Hotels in Shinagawa: Shinagawa is the 4th station from Yebisu on JR Yamanote Line, too. As I referred once, it has been a district for travelers for hundreds of years. Very convenient to go sightseeing in and out of Tokyo. 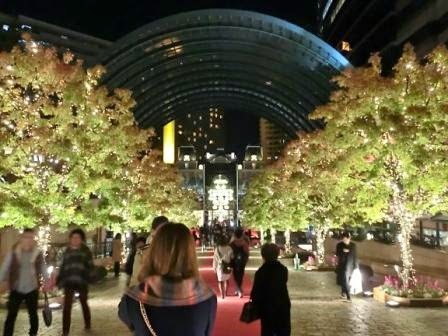 The Strings by InterContinental Tokyo is directly connected to Shinagawa Station, and I am going to write about attractions in Grand Prince Hotel Takanawa and Grand Prince Hotel New Takanawa soon. 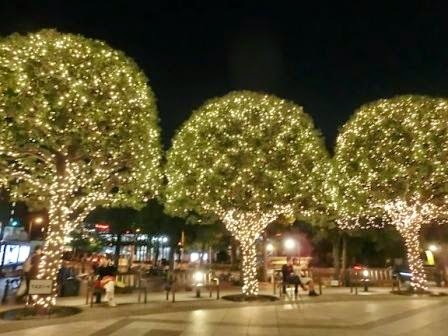 Fantastic lights! But nothing beats a good sunset! !